Rihanna not only attended this year’s Billboard Music Awards but she also took to the stage to perform Love On The Brain, which was a nice surprise since everyone expected her to do one of her current singles. This was a highly anticipated appearance since the Barbadian entertainer has only attended the show twice before (click here for some throwback fashion) and it’s also the first time she’s performed on US television since releasing her newest album, Anti. The singer was styled by Mel Ottenberg and his styling assistant Alexa Lanza shared the details on all three of her outfits. Rih’s first look included a vintage dress by Thierry Mugler. The jacket-inspired dress is from Mugler’s Spring 1988 collection and is made of brown silk that has a slight sheen. It features a thin lapel, an asymmetric snap button closure, flap pockets and padded shoulders. This one was sourced from Alexandra New York. She wore it with a custom pair of Manolo Blahnik‘s Borli gold mules. The pointed-toe shoes are distinguished by a stiletto heel, an upper covered in suede lace and a crsytal-embellished buckle. Above is a photo of the Spring 2014 version that was sold in stores but Rihanna’s version has a yellow stone at the centre of the buckle. Ottenberg posted a photo of the exact shoes on his Instagram. Her jewellery included a stunning pair of diamond earrings by Neil Lane and a yellow gold and white diamond baguette ear cuff by Borgioni. She also rocked a solitaire diamond ring by Jacob & Co. that features an etched gold band. On her left wrist was a yellow gold and tourmaline bracelet by Le Vian as well as three white diamond and 18k white gold bracelets by Hearts On Fire – the Temptation three prong bracelet ($14,500) in two sizes and one Lorelei ribbon bracelet ($18,990). Rihanna stuck with vintage Mugler for her performance (click here to watch) and her stylist shared this backstage photo of the look. She wore a pantsuit from the early 1980s. The coolest aspect of the tuxedo is clearly the off-the-shoulder blazer with its green marabou feather-trimmed neckline. The jacket (pictured above in pink) also boasts satin trim on the sleeves and pockets. The Barbadian beauty finished the look with metal sunglasses by Alain Mikli from Selima Optique and a pair of RoSa‘s black patent leather slingback pumps with an elongated pointed toe. Purchase here for £159.00. Before she hit the stage she switched up some of her jewellery. Rih donned another ear cuff by Borgioni but this one features three bands of baguette emeralds. 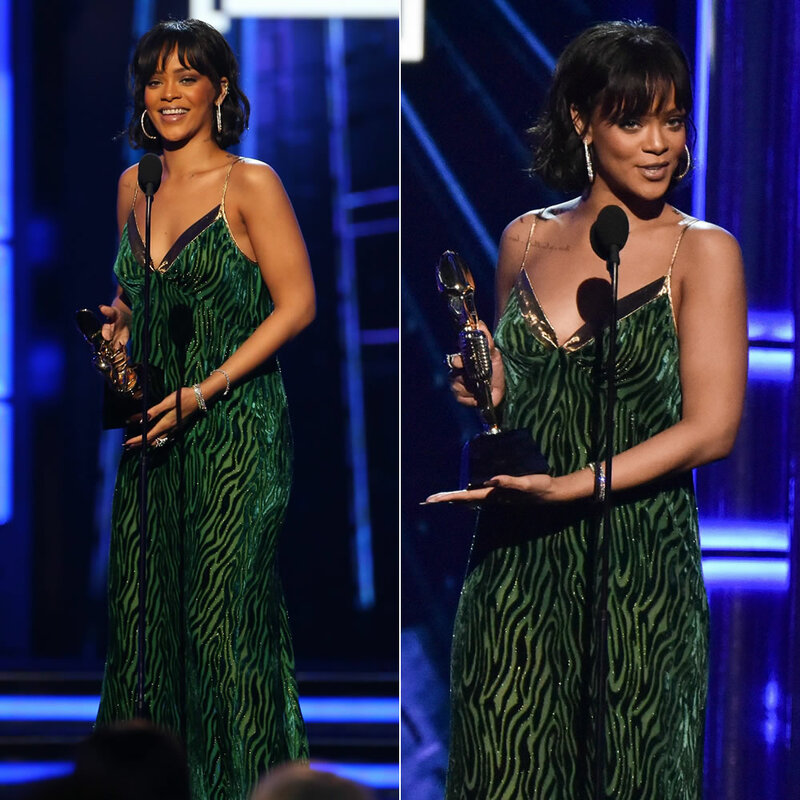 She also wore two green tourmaline, white diamond and white gold rings by Jacob & Co.
Later that night Rihanna took home the Billboard Chart Achievement award and she accepted it while wearing a dress from Dries Van Noten‘s Fall/Winter 2016 collection [Look 49]. The green velvet slip dress features thin gold straps and gold trim along the v neckline. Here Rihanna changed her earrings for the third time that night and rocked a pair of white diamond hoop earrings by Jacob & Co.